Each morning my son and me make ourselves a either a fruit juice or a vegetable juice or if we have a bit more time we will make up combinations of fruit and veg. My son has been training as a boxer since he was 14 years old he has won several boxing championships and he is in the shape of his life now that he is almost 23 I have watched him change from a boy into a man and this has inspired me at the age of 51 to keep myself as fit as I can. One thing that having a son of this age does is keep you on your toes. Well if it’s good enough for him must be good enough for me. So that’s what got me into Juicing. Now after I do my normal routine of standing like a tree I do several rounds of boxing training. 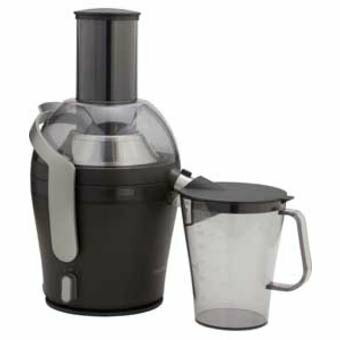 The Philips HR 1869 Juicer can juice whole pieces of fruit and veg which speeds up the time it takes to get your juicing done, with the more than ample sized 2.5 Litre container. Because the container is this big me and Ali can share one container full giving us around 1,25 Litres each about the same size as the average carton of orange juice for a fraction of the price. Just juice and maybe add ice cubes if you prefer. When you have finished your drink you will find that cleaning the Philips HR 1869 is very easy. all the compartments come apart very easily. Also available here at ebay : are a further selection of juicers.